We've had the joy and privilege of watching the smoke plume of the June 27 lava flow from Kilauea Volcano from our lanai (balcony) for months. We didn't know that it was coming to us. On October 26th we were evacuated from our home, and on October 28th we were shocked to see lava on our land and a mostly unused cabin had burnt down. "The shack heard around the world," it was famous in the news as the first structure taken by this lava flow. 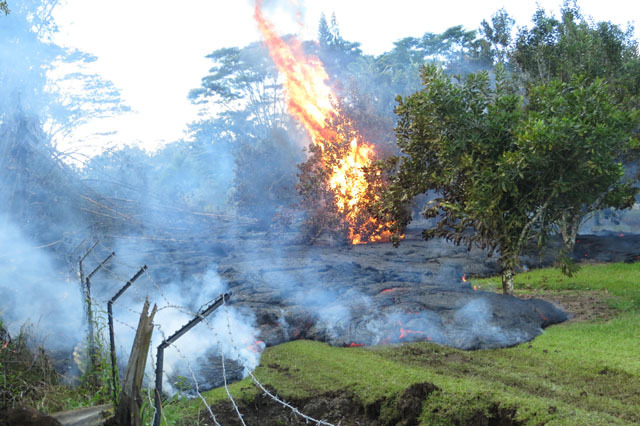 Since then, we have watched lava creating land on and around our property. For a science-nerd like me, it is amazing, awesome, mesmerizing. I'd like to share some photos of our experiences. 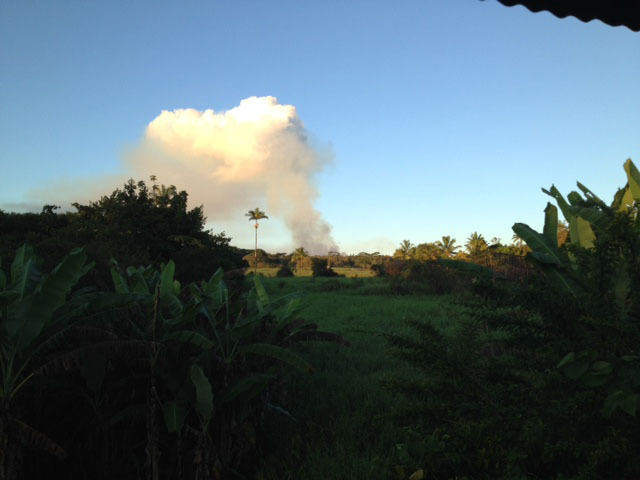 The view from our lanai on September 15, 2014. 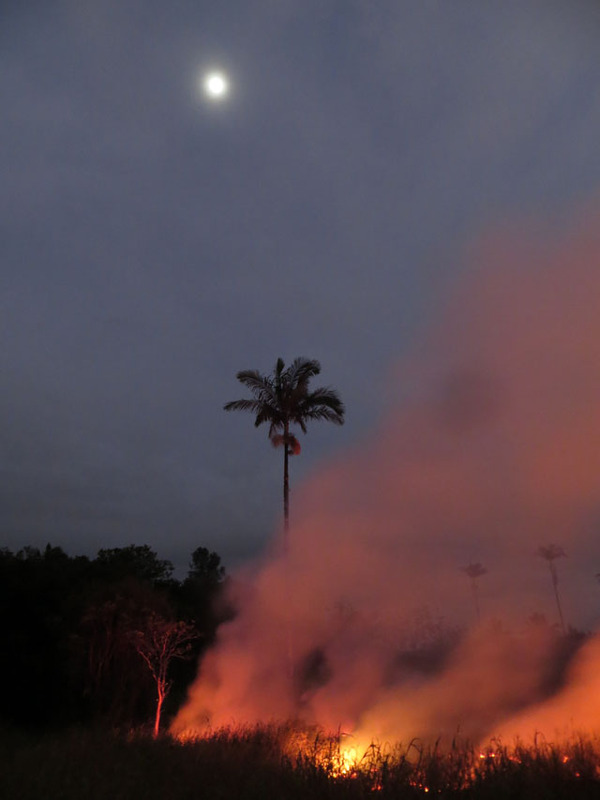 The smoke plume is from burning vegetation at the front of the lava flow from Pu'u O'o on Kilauea. Notice that the smoke creates clouds. The plume glows red at night. We thought we had until Tuesday Oct 28 to evacuate, but we were rush-evacuated on Sunday October 26 due to the lava picking up speed in our direction. After we frantically packed and loaded out, we spent the night checking on the progress of the lava with some very friendly fire people. The next morning the lava had turned direction from our house. The above picture from Monday October 25 shows the lava with our solar panel stripped house in the background. 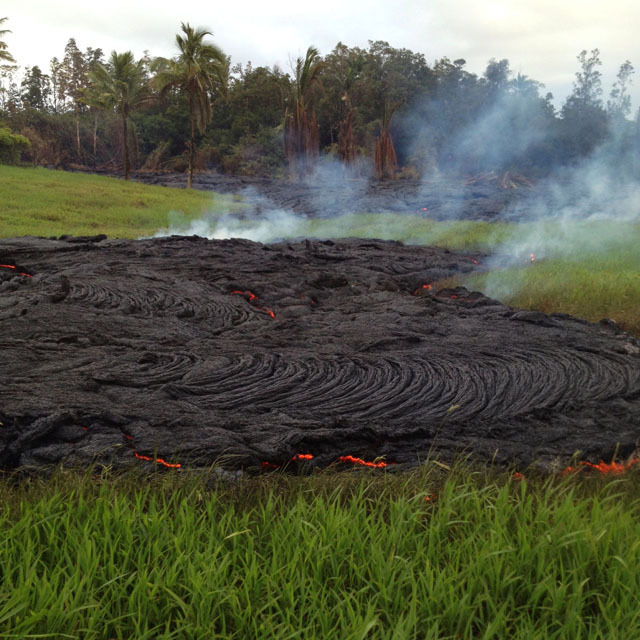 Beautiful new ropey pahoehoe lava in the field near our house on October 27, 2014. My parntner Jeremy Lutes caught me taking a photo. The scene was surreal and amazing. The lava was close to our house, but on Monday night the geologists thought it would miss our land. 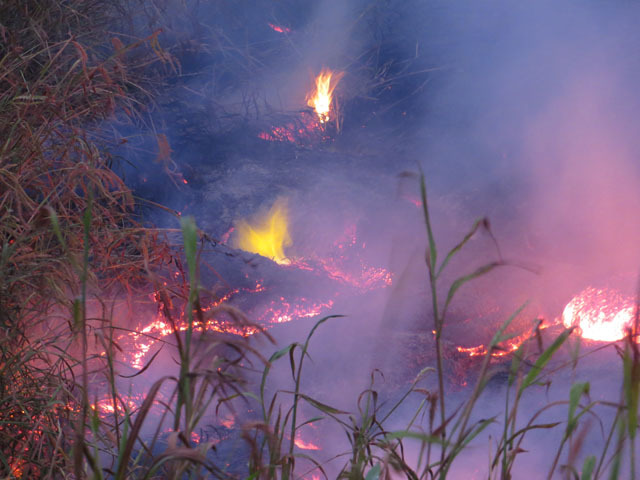 We were shocked to arrive on Tuesday morning, October 28, to find flowing, glowing lava on our property. 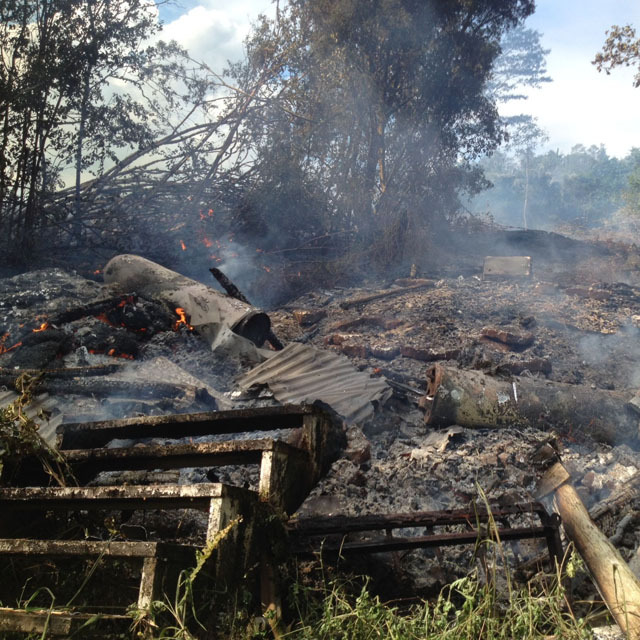 A cabin we rarely used had burned down a couple of hours before we arrived on Tuesday morning. It was the first structure destroyed by this lava flow, and it became news-famous. I call it "the shack heard around the world." Later that day this whole area was covered with lava. 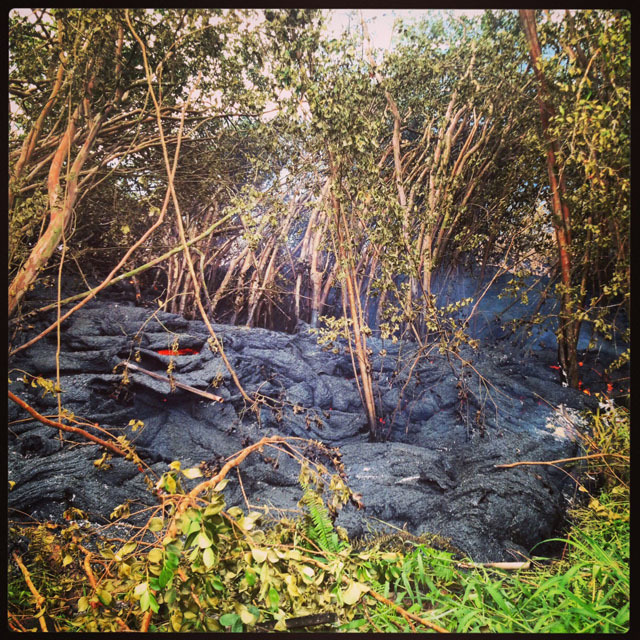 The lava covered a corner of our land but was mostly on our neighbor's property. The mac nut trees in his orchard would become surrounded by lava, dry out, and suddenly burst into flames and shimmering ash. The lava was only active on our land for one day. On Wednesday the flows were blacked with glowing red cracks here and there. For the next few days, we were able to explore active flows in the area. 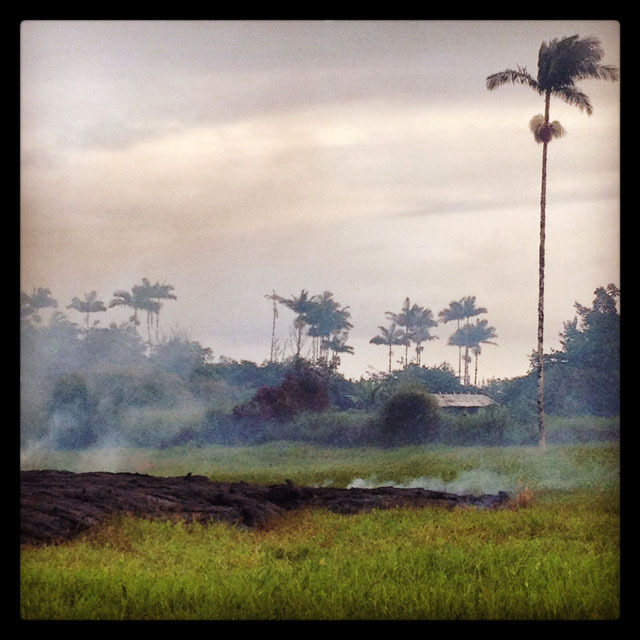 The above photo is from an active lava field near our house. Note the greenish color of the flame from a methane pocket. These lava field look like places described in mythology, not like something from this world and this time. 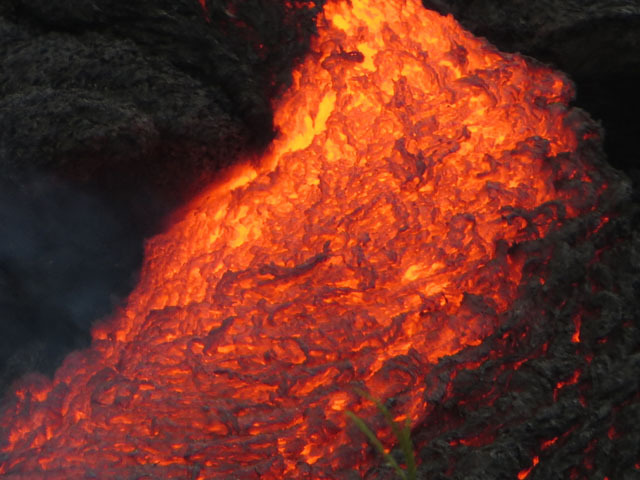 A look at the texture of cooling lava, which makes crackling noises as the surface cools. 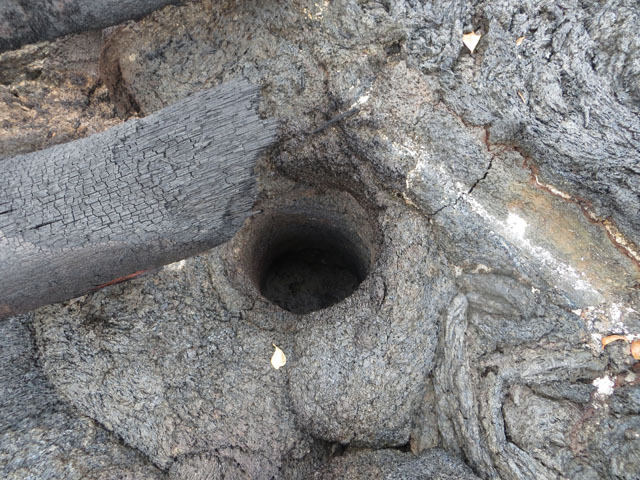 Hole in ~4 day-old lava from a royal palm tree. The hole is filled with ashes. 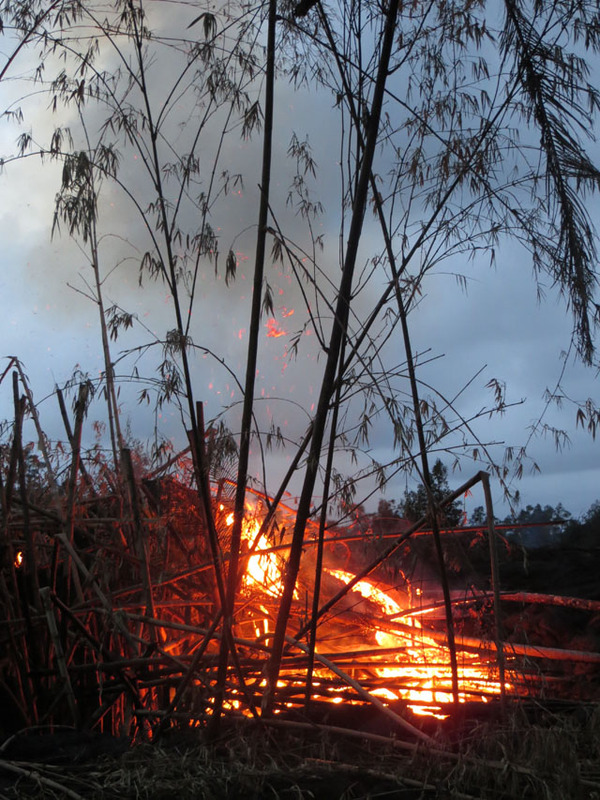 After almost a week without flowing lava on our land, on the evening of November 3, 2014 lava suddenly started gushing from the old flow. It burned our already lava-toasted bamboo. The bamboo segments made loud gunshot-type noises when they popped. Firework-like ashes were propelled into the air, as you can see in this photo. This flow had stopped by the next morning. Thank you to Timothy R Taylor for the phrase "Made With Magma" - love it!